The UCREL semantic analysis system is a framework for undertaking the automatic semantic analysis of text. The framework has been designed and used across a number of research projects and this page collects together various pointers to those projects and publications produced since 1990. The semantic tagset used by USAS was originally loosely based on Tom McArthur's Longman Lexicon of Contemporary English (McArthur, 1981). It has a multi-tier structure with 21 major discourse fields (shown here on the right), subdivided, and with the possibility of further fine-grained subdivision in certain cases. We have written an introduction to the USAS category system (PDF file) with examples of prototypical words and multi-word units in each semantic field. The full tagset is available on-line in plain text form and formatted on one page in PDF. We also have a list of the full descriptive labels of the semantic subcategories. You can also see the USAS semantic tagset in Russian as a two page PDF and text file. For other languages, see below. A visual representation showing the USAS tagset heirarchy is now on-line, along with those for the Louw-Nida model and the Hallig/Von Wartburg/Schmidt/Wilson Model. You can try out the English semantic tagger online. Beginning in 2013, the USAS framework is being extended to cover many more languages including: Chinese, Dutch, Italian, Portuguese, Spanish and Malay. The Java software framework developed in the Benedict and ASSIST projects has been modified to accommodate these languages, and semantic lexicons are compiled for them by automatically "translating" the English semantic lexicon entries, with some manual improvement where possible. Due to the inevitable ambiguity of translations and part-of-speech correspondence across and between languages, the automatically translated lexicons contain errors, which need to be cleared manually. A website interface is provided for users to test the semantic taggers. This is a beta release of the tools, which will be improved in future. Please get in touch with Paul Rayson and Scott Piao if you would like to be involved in further improvements of the tools. Scott Piao, Paul Rayson, Dawn Archer, Francesca Bianchi, Carmen Dayrell, Mahmoud El-Haj, Ricardo-María Jiménez, Dawn Knight, Michal Kren, Laura Löfberg, Rao Muhammad Adeel Nawab, Jawad Shafi, Phoey Lee Teh and Olga Mudraya. (2016) Lexical Coverage Evaluation of Large-scale Multilingual Semantic Lexicons for Twelve Languages. In proceedings of the 10th edition of the Language Resources and Evaluation Conference (LREC2016), Portoroz, Slovenia, pp. 2614-2619. Note: The lexical resources and other files can be downloaded from our GitHub repository (https://github.com/UCREL/Multilingual-USAS). The links below will be updated less often than the Github repository, so please use that for the latest versions. The Dutch semantic tagger has been developed using a similar process to that of the Italian semantic tagger, using the Dutch version of TreeTagger. The Dutch lexicon has been compiled by translating the English semantic lexicon entries using a Dutch-English dictionary developed by (Tiberius and Schoonheim, 2014). As the Dictionary and TreeTagger use different POS tagsets, they are both mapped into a simplified common tagset to be used by the software system. Currently Dutch semantic single word lexicon contains 4,203 entries. We are grateful for the assistance of Dr. Carole Tiberius (INL, Netherlands) with this research. The Dutch lexicon can be accessed here (download as UTF-8): (a) Single word lexicon (b) The Dutch multiword lexicon is not available yet. In the Benedict project, we developed the Finnish Semantic Tagger as the first non-English tagger. Laura Löfberg has continued to update the semantic lexical resources during and after her Ph.D. at Lancaster University. Laura's final PhD thesis (2017) is also available and describes the process of designing, creating, and evaluating the Finnish lexicons: DOI: 10.17635/lancaster/thesis/3 The Finnish semantic lexicon can be accessed here (download as UTF-8): Single word lexicon. The tagset has also been translated by Laura. An Indonesian semantic tagger itself has not been developed yet, but we have a translation of the semantic tagset into Indonesian. The translation was carried out by Muchamad Sholakhuddin Al Fajri, Lancaster University. Via a small grant between Lancaster University and Sunway University, we are developing a Malay Semantic Tagger. A lexicon has been created and reported in the LREC2016 paper above. Thanks to Phoey Lee Teh, a Malay version of the semantic tagset is available. The Portuguese semantic tagger is being developed using a similar process to that of the Italian semantic tagger, using the Portuguese TreeTagger. The Portuguese lexicons have been compiled by translating the English semantic lexicon entries using a Portuguese-English dictionary developed by Davies and Preto-Bay (2007) and FreeLang Portuguese-English bilingual lexicon. A small section of the lexicons were manually checked, but most of the lexicon entries were automatically generated and therefore contain errors, which need to be cleared manually in the future. As the POS tagger and lexical resources use different POS tagsets, these tagsets are mapped into a simplified common tagset to be used by the software. Currently, there are two Portuguese semantic lexicons: single word lexicon (over 13,900 entries) and multi-word lexicon (over 1,780 entries). The Portuguese lexicons are being created with the help of Carmen Dayrell (CASS, Lancaster University, UK). These lexicons can be accessed here (download as UTF-8): (a) Single word lexicon (b) MWE lexicon. The Swedish semantic tagger is under development, Lisa Sjösten has translated the semantic tagset into Swedish, and Maria Nääs has manually checked over 4,000 lexicon entries. The Swedish tagger is being developed in collaboration with Anna Gustafsson and Johan Frid (Lund University, Sweden). The Swedish semantic lexicon can be accessed here: single word lexicon. The Turkish semantic tagger itself has not been developed yet, but we have a translation of the semantic tagset into Turkish. The translation was carried out by Duygu Candarli from Manchester Institute of Education, The University of Manchester. The Urdu semantic tagger is under development by Jawad Shafi, a PhD student at Lancaster University from COMSATS Institute of Information Technology, Lahore, Pakistan. The Urdu semantic lexicon can be accessed here (download as UTF-8): Single word lexicon. The tagset has also been translated and there is a mapping between the Urdu version of the tags themselves and the English version. The Welsh semantic tagger is under development in the CorCenCC project, and so far we have a translation of the semantic tagset into Welsh. The translation was carried out by colleagues on the CorCenCC project. The ACASD and ACAMRIT projects led to the initial design and implementation of the tools and applied them in the area of interview transcripts. The REVERE project applied the tools in the domain of software engineering documentation using a web front end called Wmatrix. In Benedict, we have re-implemented the English semantic tagging (EST) tool in Java, and improved the linguistic resources in the tool. In addition we developed a Finnish Semantic Tagging (FST) tool. In the ASSIST project, we extended the existing USAS framework to construct a Russian Semantic Tagger (RST). In 2013, the UCREL research centre funded initial development of the Italian, Dutch and Chinese lexicons. In 2015, a Lancaster University - Sunway University small grant funded the development of the Malay semantic tagger. Starting in 2016, with funding from the CorCenCC project, we are undertaking the development of the Welsh semantic tagger. Andrew Wilson was the RA in Linguistics on the first two projects and Paul Rayson was the RA in Computing on all five projects. Scott Piao and Dawn Archer were the RAs on the Benedict project. Olga Mudraya was the RA in Linguistics and Scott Piao was the Computing RA on the Assist project. Scott Piao is the Computing RA on the initial development of the Italian, Dutch, Chinese and other taggers and on the CorCenCC project. The grant holders and supervisors were Roger Garside (Computing), Geoff Leech (Linguistics) and Jenny Thomas (Linguistics, now at Bangor). Tony McEnery was the principal investigator for Benedict. For ASSIST, Roger Garside, Tony McEnery, Andrew Wilson and Paul Rayson were the grant holders. The English version of the USAS framework can be accessed in the web-based corpus tool Wmatrix and directly online. The Russian lexicon and MWE list are available for download here. Future updates will also be released here. We provide a zip archive containing three files: a single word lexicon, a proper name lexicon and a MWE lexicon. The current versions (14th December 2006) contain 13,153 single words, 4,444 proper names, and 713 MWE templates. For each word in the files, we include a part-of-speech tag based on the mystem tagset for Russian and a list of possible semantic tags, all of which have been manually checked. For more details about the Russian resources, see Mudraya et al (2006). These Russian lexical resources are licensed under a Creative Commons Attribution-NonCommercial-ShareAlike 2.5 License. The Italian, Chinese and Dutch resources are available and linked above. Wilson, A. (1993). Towards an Integration of Content Analysis and Discourse Analysis: The Automatic Linkage of Key Relations in Text. UCREL Technical Paper 3, Linguistics Department, Lancaster University. Wilson, A. and Thomas, J.A. (1997) Semantic annotation, in Garside, R., Leech, G., and McEnery, A. (eds.) Corpus Annotation: Linguistic Information from Computer Text Corpora. Longman, London, pp. 53-65. Garside, R., and Rayson, P. (1997). Higher-level annotation tools. In. R. Garside, G. Leech, and A. McEnery (eds.) Corpus Annotation: Linguistic Information from Computer Text Corpora. Longman, London. pp 179 - 193. Dawn Archer, Tony McEnery, Paul Rayson, Andrew Hardie (2003). Developing an automated semantic analysis system for Early Modern English. In Dawn Archer, Paul Rayson, Andrew Wilson and Tony McEnery (eds.) Proceedings of the Corpus Linguistics 2003 conference. UCREL technical paper number 16. UCREL, Lancaster University, pp. 22 - 31. Laura Löfberg, Dawn Archer, Scott Piao, Paul Rayson, Tony McEnery, Krista Varantola, Jukka-Pekka Juntunen (2003). Porting an English semantic tagger to the Finnish language. In Dawn Archer, Paul Rayson, Andrew Wilson and Tony McEnery (eds.) Proceedings of the Corpus Linguistics 2003 conference. UCREL technical paper number 16. UCREL, Lancaster University, pp. 457 - 464. Scott S. L. Piao, Paul Rayson, Dawn Archer, Andrew Wilson and Tony McEnery (2003). Extracting Multiword Expressions with a Semantic Tagger. In proceedings of the Workshop on Multiword Expressions: Analysis, Acquisition and Treatment, at ACL 2003, 41st Annual Meeting of the Association for Computational Linguistics, Sapporo, Japan, July 12, 2003, pp. 49-56. Piao, Scott S. L., Paul Rayson, Dawn Archer, Tony McEnery (2004). Evaluating Lexical Resources for A Semantic Tagger. In proceedings of 4th International Conference on Language Resources and Evaluation (LREC 2004), May 2004, Lisbon, Portugal, Volume II, pp. 499-502. ISBN 2-9517408-1-6. Rayson, P., Archer, D., Piao, S. L., McEnery, T. (2004). The UCREL semantic analysis system. In proceedings of the workshop on Beyond Named Entity Recognition Semantic labelling for NLP tasks in association with 4th International Conference on Language Resources and Evaluation (LREC 2004), 25th May 2004, Lisbon, Portugal, pp. 7-12. Archer, D., Rayson, P., Piao, S., McEnery, T. (2004). Comparing the UCREL Semantic Annotation Scheme with Lexicographical Taxonomies. In Williams G. and Vessier S. (eds.) Proceedings of the 11th EURALEX (European Association for Lexicography) International Congress (Euralex 2004), Lorient, France, 6-10 July 2004. Université de Bretagne Sud. Volume III, pp. 817-827. ISBN 2-9522-4570-3. Scott S.L. Piao, Dawn Archer, Olga Mudraya, Paul Rayson, Roger Garside, Tony McEnery, Andrew Wilson (2005) A Large Semantic Lexicon for Corpus Annotation. In proceedings of the Corpus Linguistics 2005 conference, July 14-17, Birmingham, UK. Proceedings from the Corpus Linguistics Conference Series on-line e-journal, Vol. 1, no. 1, ISSN 1747-9398. Qian, Yufang and Scott Piao (2009). The Development of A Semantic Annotation Scheme for Chinese Kinship. Corpora, Vol. 4 (2), Edinburgh University Press. pp. 189-208. Piao, S., Bianchi, F., Dayrell, C., D'Egidio, A. and Rayson, P. (2015). Development of the multilingual semantic annotation system. In proceedings of the 2015 Conference of the North American Chapter of the Association for Computational Linguistics - Human Language Technologies (NAACL HLT 2015), Denver, Colorado, United States, pp. 1268-1274. Wilson, A. and Leech, G.N. (1993). Automatic Content Analysis and the Stylistic Analysis of Prose Literature. Revue: Informatique et Statistique dans les Sciences Humaines 29: 219-234. Thomas, J., and Wilson, A. (1996). Methodologies for studying a corpus of doctor-patient interaction. In J. Thomas and M. Short (eds) Using corpora for language research. Longman, London, pp 92-109. Rayson, P., Garside, R., and Sawyer, P. (1999). Recovering Legacy Requirements. In Proceedings of REFSQ'99 Fifth International Workshop on Requirements Engineering: Foundations of Software Quality, June 14-15 1999, Heidelberg, Germany. Published by University of Namur, pp. 49-54. ISBN 2 87037 307 4. Rayson, P., Emmet, L., Garside, R., and Sawyer, P. (2000). The REVERE Project: Experiments with the application of probabilistic NLP to Systems Engineering. In proceedings of 5th International Conference on Applications of Natural Language to Information Systems (NLDB'2000). Versailles, France, June 28-30th, 2000. Barbara Lewandowska-Tomaszczyk, Michael Oakes & Paul Rayson (2001). Annotated Corpora for Assistance with English-Polish Translation. Paper presented at Corpus Linguistics 2001, Lancaster University, UK, March 30-April 2, 2001. S. Sharoff, P. Rayson, O. Mudraya, A. Wilson and T. McEnery (2004). A tool for assisting translators using automatic semantic annotation. Presented at Corpus Use and Learning to Translate (CULT-BCN) Barcelona, January 22nd-24th 2004. Marilyn Deegan, Harold Short, Dawn Archer, Paul Baker, Tony McEnery, Paul Rayson (2004) Computational Linguistics Meets Metadata, or the Automatic Extraction of Key Words from Full Text Content. RLG Diginews, Vol. 8, No. 2. ISSN 1093-5371. 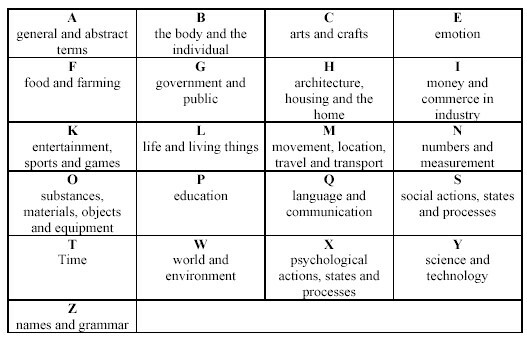 Jones, M., Rayson, P. and Leech, G. (2004) Key category analysis of a spoken corpus for EAP. Presented at The 2nd Inter-Varietal Applied Corpus Studies (IVACS) International Conference on "Analyzing Discourse in Context" The Graduate School of Education, Queen�s University, Belfast, Northern Ireland, 25 - 26 June, 2004. L�fberg L, Juntunen J-P, Nykanen A, Varantola K, Rayson P, Archer D. (2004). Using a semantic tagger as dictionary search tool. In Williams G. and Vessier S. (eds.) Proceedings of the 11th EURALEX (European Association for Lexicography) International Congress (Euralex 2004), Lorient, France, 6-10 July 2004. Université de Bretagne Sud. Volume I, pp. 127-134. ISBN 2-9522-4570-3. Archer, D. and Rayson, P. (2004) Using an historical semantic tagger as a diagnostic tool for variation in spelling. Presented at Thirteenth International Conference on English Historical Linguistics (ICEHL 13) University of Vienna, Austria 23-29 August, 2004. Sharoff, S., Babych, B., Rayson, P., Mudraya, P. and Piao, S. (2006) ASSIST: Automated Semantic Assistance for Translators. In companion proceedings to the 11th Conference of the European Chapter of the Association for Computational Linguistics (EACL 2006), Trento, Italy, April 3-7, 2006, pp. 139 - 142. ISBN 1-932432-60-4. Andrew Wilson, Olga Moudraia (2006) Quantitative or Qualitative Content Analysis? Experiences from a cross-cultural comparison of female students' attitudes to shoe fashions in Germany, Poland and Russia. In Andrew Wilson, Paul Rayson and Dawn Archer (eds.) Corpus Linguistics around the world. Rodopi, Amsterdam.